Every once in a while, a couple asks us to do something crazy and outside of our comfort zone, and in all honesty, we LOVE it. 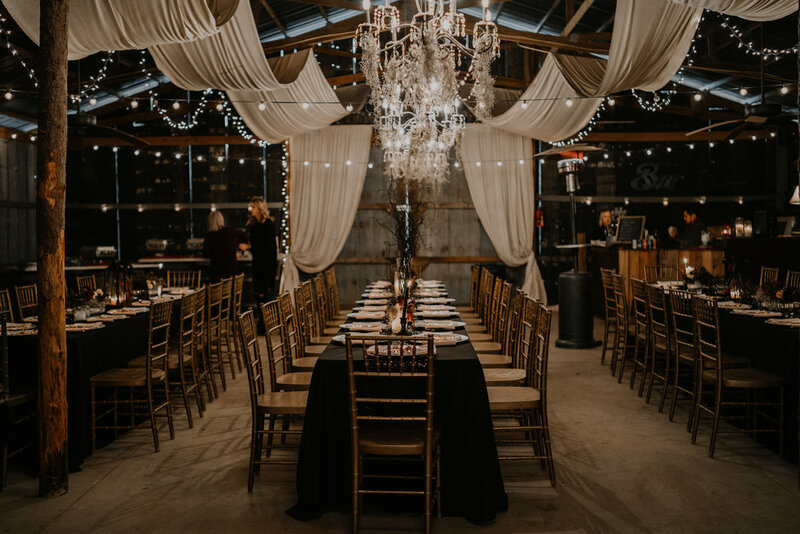 We’ve done several weddings that fall into the “one of a kind” category, and this one should definitely be filed as one of The Barn’s craziest weddings ever. And we mean that in very much a GOOD way. How awesome is our team for being able to pull off everything from more traditional weddings to Gothic-Victorian weddings like this one. There’s nothing they can’t do! 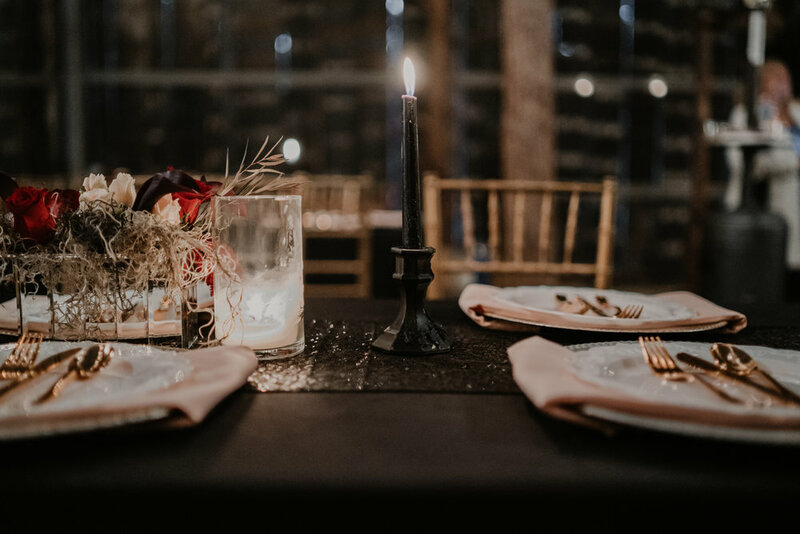 Kai from Khaleel Photography was the most perfect photographer we could’ve imagined for a wedding like this one; his photos are moody, a little dark and gorgeous. This one probably won’t fit with most of our readers’ styles, but it’s so uniquely beautiful and we know you will love it! 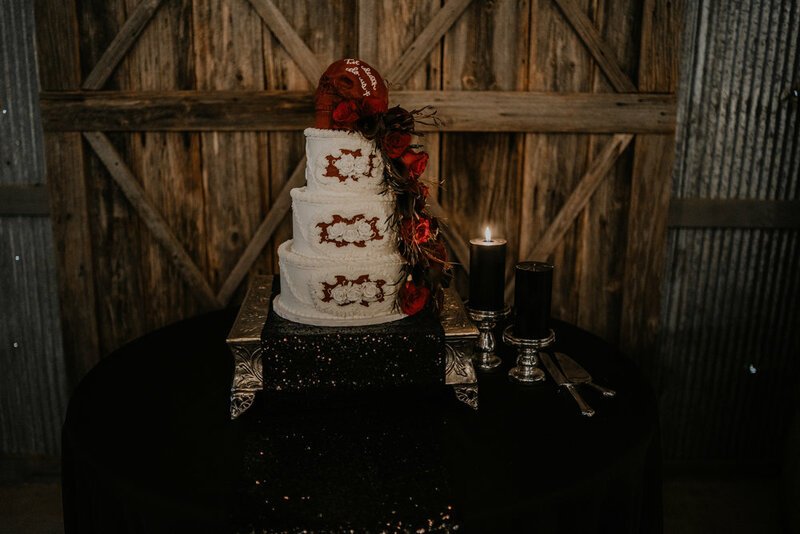 Our team’s creativity really shines through in this wedding’s details… just wait until y’all see the ceremony and reception details and the most insane cake you’ve ever laid eyes on! There were so many incredible, unique details at this wedding, but the bride’s dress (from Always & Forever) was one of our favorites, hands down. The Barn’s first black bridal gown EVER, and we’re in love with it! She kept the goth vibes going with her nails and accessories, as well. This couple went all out with their theme and they rocked it! For the couple’s bouquets and florals, our team chose dark red roses and black star calla lilies. “It was so me!” the bride said. The ceremony details were a little creepy and seriously cool. 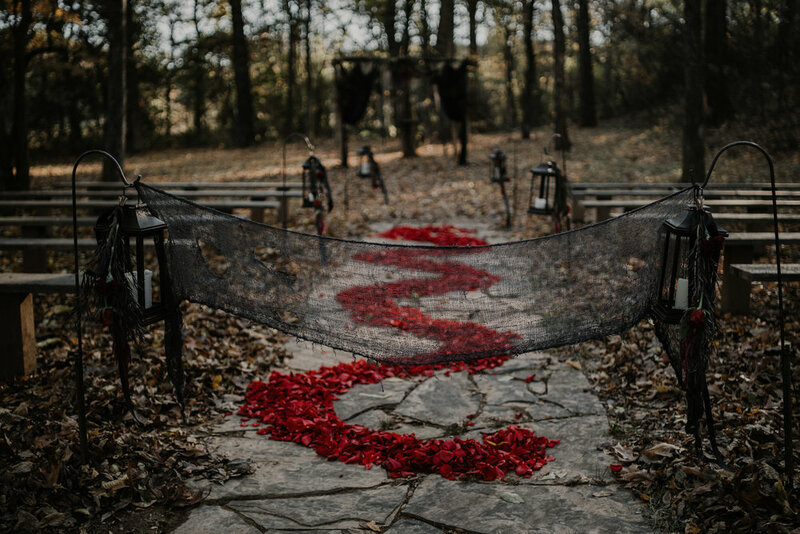 We did an epic dark red rose petal design down their aisle, and their altar was Gothed out with a black drape, and black and dark red florals. Their aisle was lined with lanterns with black ribbons and hanging dark red flowers. It was uniquely gorgeous, and even though it was not our norm, we were totally into it. Their reception was equally Gothic, Victorian and elegant. 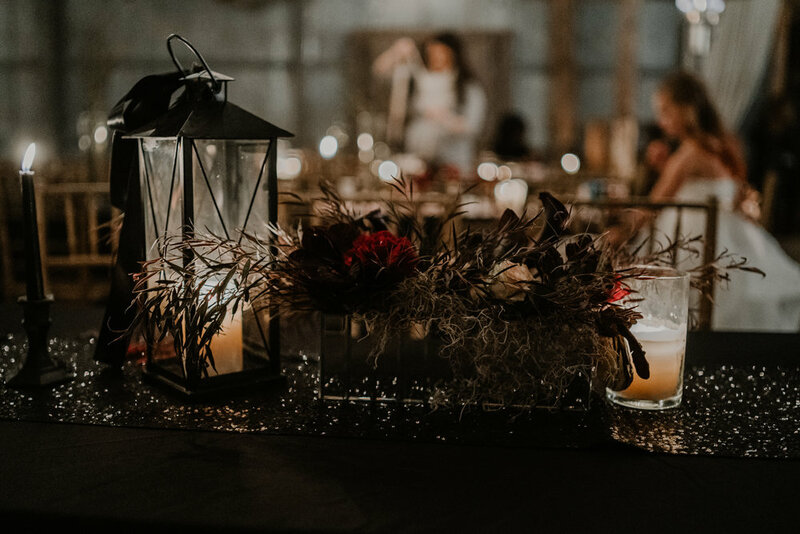 Their tables included black tablecloths, sparkly black sequined runners, black and red florals in mirrored boxes, candles (including some awesome black tapers in black candlesticks), lanterns, and vases filled with branches. 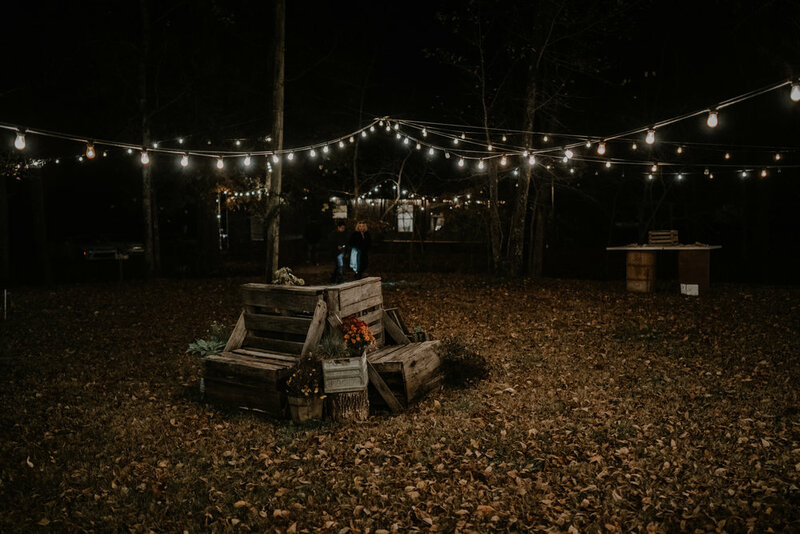 Their sweetheart table included hanging bulbs and a little bit of fog action for the perfect creepy touch. 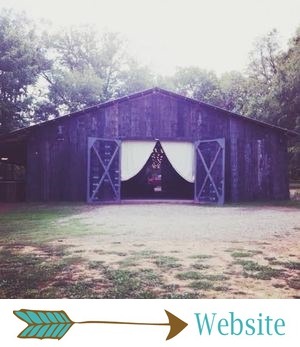 It was beautiful, and the bride said the inside of The Barn was one of her favorite parts of her wedding day. Who knew goth could be so darn pretty?! Remember when I said this wedding had the most insane cake ever?! Here it is in all its glory! Kneading Hands Bakery absolutely blew us away with this gorgeous, super detailed Victorian style cake. Check out that level of detail! 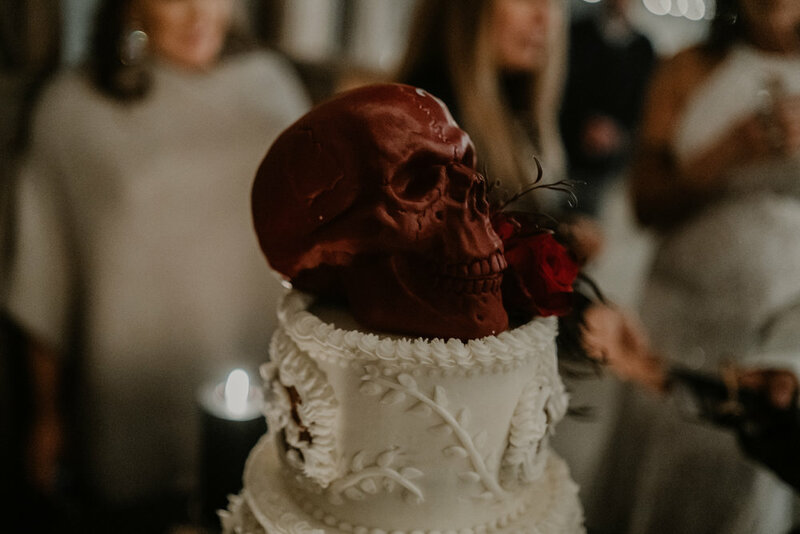 Our team created a custom red “til death do us part” skull topper and added dripping black calla lilies and red roses. The black candles and sparkly black runner on their cake table were the icing on the cake! 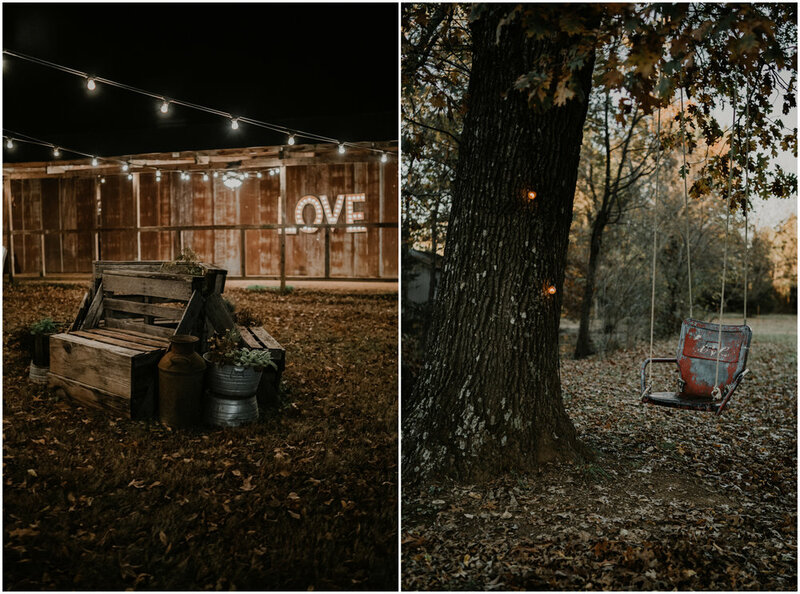 Kai took such gorgeous pictures around The Barn, and since this bride said The Barn itself was her favorite detail of the day, let us just brag for a minute about how pretty this place is. ;) Check out the creepy vibes in that first photo!